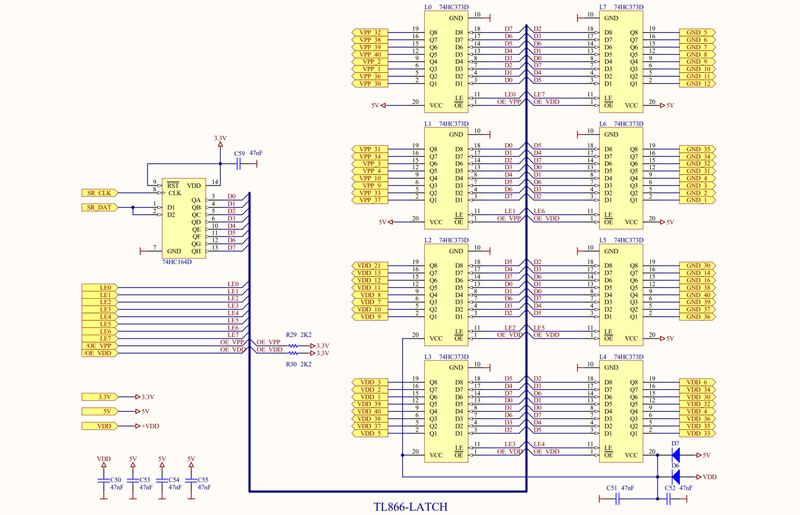 Below is the pin driver schematic for the MiniPro TL866 universal device programmer (page 2 of the PDF schematic). The L2, L3 and L4 are powered from VDD, which can be anywhere from 2.0V to 6.0V (from the programmer spec). This limit, as far as I understand, is imposed by the operating VCC range of 74HC373D, which is also 2.0-6.0V. These latches are used to switch a pin of ZIF socket to the VDD voltage. 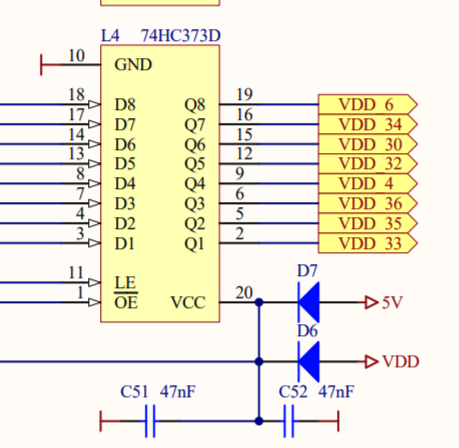 Now the question: say VDD was programmed to 2.0V, but the supply voltage of 74HC164D is fixed at 3.3V. So now we have L2, L3, L4 supplied 2.0V to VCC pins, but they will receive 3.3V on their D1..D8, LE and ~OE pins. How come the 74HC373Ds withstand that voltage, which is 1.3V above power supply voltage? In the datasheet, the input voltage absolute maximum ratings are specified as -0.5 to VCC + 0.5. Sorry for a possibly silly question! Not the answer you're looking for? Browse other questions tagged power-supply digital-logic or ask your own question. How to hook up an FPGA to a component that has a different power supply? How should power be supplied for in-system programming? DC circuit schematic has both positive and negative supply as well as ground?